I am continually amazed at the natural shapes found in Nature. These Two Hearts were revealed when someone cut away the dead trunks of a dying tree. 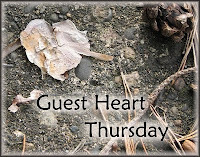 For more heart art, photography and altogether fabulous heat stuff from around the world, visit Clytie at Random Hearts for Guest Heart Thursday! I was struck by the symmetry of this shape in the sky--to me it looks like the shape of a face. One of my good friends says she thinks it looks like a very fat cat with a curving tale. What do you think? Ever felt like you are being watched? This was the face I saw when I looked up from weeding my garden. Clouds never cease to fascinate and to amaze me. Today is my birthday. What fun to discover a natural heart settled in the needles of the spiny blue fir next to our home. A beautiful gift from the faeries in my garden--and so perfect for Guest Heart Thursday! For more heart art, photography and altogether fabulous heart stuff from around the world, visit Clytie at Random Hearts for Guest Heart Thursday! I love it when God throws kisses into the skies! I feel hugged.